The first English-language film from Norwegian director Eric Poppe is a conscientious and beautifully shot movie that ultimately bogs down in its own disinclination to come to any kind of dramatically useful conclusion about its subject. Said subject is Rebecca. Rebecca is accomplished, brilliant, and beautiful. Just the fact that she’s played by Juliette Binoche tells the viewer those things. Rebecca’s a photographer, and as the movie opens, she’s snapping away while wearing a relatively unrestrictive hijab, chronicling a group of other women as they prepare a…suicide bomber. 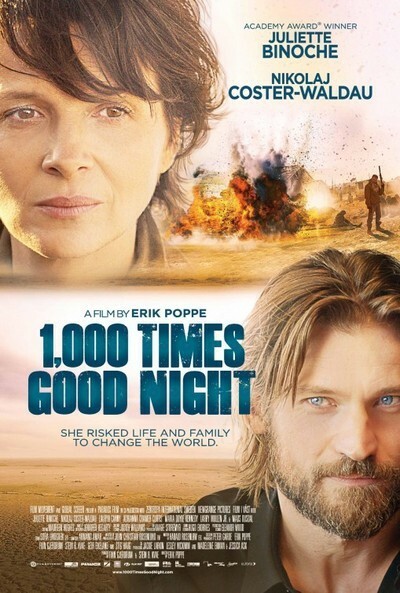 Accomplished and brilliant as Rebecca is, she’s not infallible, and an explosion soon blasts the camera out of her hands and sends her home wounded to her husband (Nikolas Coster-Waldau) and two daughters. Needless to say, said husband is not too excited with Rebecca’s career at this point. “You said you loved me because I had passion, I had fire…” Rebecca protests to her husband after he intimates that this time, enough’s enough. It’s pretty clear right off the bat that Rebecca’s addicted to the danger of being a war photographer; there are several senses in which this movie feels like Kathryn Bigelow’s “The Hurt Locker” with a female protagonist. Only, alas, not as good. The scenes of domestic confrontation and argument are almost determinedly clichéd; the adults speak in hushed tones so the children won’t hear, there’s a lot of staring out of car windows. There are also a lot of stunning vistas of the Irish countryside (like a lot of European film productions these days, the movie largely takes place in a real landscape that’s also part of the unusual phantom zone of Europe in which non-British-accented English is the default language). By the point one of the daughters observes “When Daddy sleeps on the sofa it’s never a good time…,” my eyerolls might have become audible. The movie does pick up here and there, especially when Binoche’s character gets a chance to explain why she does what she does. When she lays out for her daughter the greed for diamonds and precious metals that sets off civil wars in Africa, the character’s anger and commitment come to vivid life. The movie doesn’t sufficiently connect those commendable qualities to Rebecca’s recklessness, which is vividly conveyed in a scene set in an ostensibly “conflict-free” site in Kenya that Rebecca visits with her daughter. When an armed group usurps that site, Rebecca ostentatiously puts herself in harm’s way after dispatching her own child with maniacal haste. Engaging but ultimately frustrating scenes are one thing. Elsewhere, the movie keeps bringing home the inescapable fact that striking imagery, deliberate pacing and scrupulous good taste are not sufficient substitutes for genuine thoughtfulness and/or dramatic urgency. The striking imagery is also sometimes almost laughably misplaced; the movie reaches one climax with what’s likely the most immaculately staged school show-and-tell scene in the history of cinema. If I’m complaining about this movie a lot for one I’m deeming better than fair, it’s because I was frustrated by how its first-rate ingredients, Binoche chief among them, somehow failed to create a spectacular end result.